China is fast becoming a popular study destination amongst international students. One thing that must not be ruled out is its affodability and hostle-free nature of the people. There are reconizable higher institutons in China that as well as offer quality education. One of such is the Tianjin University. Tianjin is a coastal metropolis in northern China and one of the four national central cities of the People’s Republic of China. Tianjin University (TJU) is the first modern higher education institution in China, and now a national university under the direct administration of the Ministry of Education of China. It was established in 1895 as Tientsin University/Imperial Tientsin University and later Peiyang University (Beiyang University)In 1951, after restructuring, it was renamed Tianjin University, and became one of the largest multidisciplinary engineering universities in China. The university was one of the first 16 universities accredited by the nation in 1959. It is also among the first group of institutions of higher learning in the national “211-Project” to which priority is given in construction. Tianjin University has been an academic leader in research and teaching in China since its establishment in 1895. Among the first group of universities to be included in the “211” and “985” projects, Tianjin University is committed to constantly improving its educational quality and level of scientific research in an effort to maintain its position as a world-class institution. Tianjin University welcomed its first batch of international students in 1954. Home to more than 20,000 international students from more than 140 countries and regions, TJU has become one of the best universities to study in China. 1. Academic and Research Excellence The University was the first in China to fully adopt a western style university education system. Since its establishment, it operated according to an American model, where the western style of learning was mainly taught. 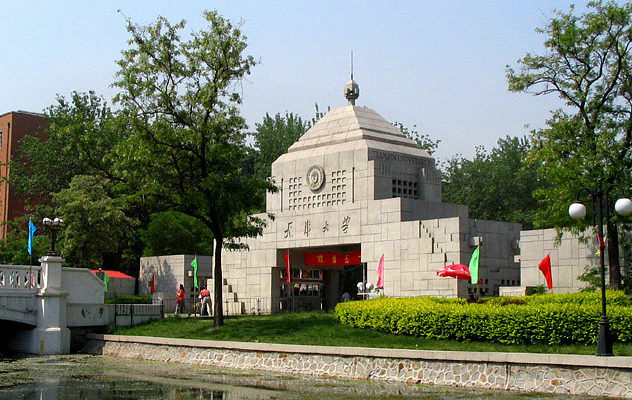 Over the 120 years, the University has established a reputation as one of the leading research and teaching centers in China. The University gives precedence to the study of engineering and has developed a balanced offering of disciplines including science, economics, management, literary arts, law, and education. 2.Scholarships and Awards With its Internationalization Strategy launched in 2010, the University offers a variety of scholarships and awards to financially support qualified international students, including Chinese Government Scholarships, Confucius Institute Scholarships, Tianjin Municipal Government Scholarship, Tianjin University International Student Scholarships, and many awards for those with excellent academic performance. 3.Cosmopolitan Community Situated in the heart of Tianjin City, one of the four municipalities directly under the Central Government of China, the University offers an unrivaled student experience in a thriving, cosmopolitan community which will set the scene for the rest of your life. Known as a microcosm of modern China, Tianjin has been selected as the best commercial city and the most creative city in mainland China, also one of top ten Charming Tourist Cities in the nation. 4.Job Offers and Internship Opportunities Tianjin is now an economic center, the largest international port city and an eco-city in northern China. With the national strategies of Tianjin Binhai New Area, Beijing-Tianjin-Hebei integration and Tianjin Free Trade Zone, a number of leading companies have their branches, R&D centers or even headquarters in Tianjin, which bring plenty of job offers and internship opportunities. 5.Low Cost of Living Tianjin enjoys the convenience as Beijing’s neighbor and has a much lower cost of living compared with other cities in its category, such as Shanghai and Beijing. Applicants for the Degree Programs must submit all application materials for admission to Tianjin University. Before filling in the application form, please ensure that you have read the instructions on the admission procedures and requirements specified in the section of FIND A DEGREE at www.tju.edu.cn/sie/en/. After you have completed all the application materials, you must mail them in duplicate to the International Admissions Office, Tianjin University. Field of Science and Engineering: HSK 4 (Score 180 or above) for programs taught in Chinese TOEFL (Score 80 or above) or IELTS (Score 6.0 or above) for programs taught in English (Not required for native English speakers) -Field of Liberal Arts: HSK 5 (Score 180 or above) for programs taught in Chinese TOEFL (Score 80 or above) or IELTS (Score 6.0 or above) for programs taught in English (Not required for native English speakers) If the applicant’s Chinese proficiency has not yet met the requirement of admission, he/she can study Chinese Language at Tianjin University for one year and obtain the required certificate of HSK.